In my last blog post, "Myth-Busting Model Releases", I received quite a bit of email from people about "commercial uses"of images, pointing to other discussion forums where, again, myths and hearsay prevailed among many misinformed, but well-intentioned photographers. On the commercial side, there are companies that sell books, magazines, newspapers and other forms of media. While the content of their media may be editorial in nature (which doesn't require a release), the promotion of their products is commercial in nature. Just because they may be promoting an editorial product, it's irrelevant. Promotion is a commercial activity. Full stop. But again, "commercial use" does not itself trigger the need for a release. 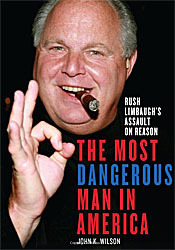 For example, a highly critical book about Rush Limbaugh ("The Most Dangerous Man in America"), by John Wilson) sports a photo of Rush himself on the front cover. And given the scathing nature of how Rush is portrayed in the book as an irresponsible, sexist, racist, ideologue, one would expect that Rush signed no model release or provided consent of any kind to have him or his likeness be associated in any way with this book. Obviously, the text is editorial commentary about the controversial radio host, so no consent is necessary for using the photo on the book itself. But what about the promotion and advertising for the book? Both of those are "commercial" in nature: profits are made, and the book itself is a product. Again: promotion is "commercial use." Full Stop. So, one would think that Rush would have his lawyers find any legal position possible to stop or slow down the supply chain, from the photographer to the stock agency to the publisher. Yet, there it is in full color, used to both promote and advertise the book. So, the fact that a photo is used as part of a promotion is a red herring. Photos may be on web pages, in portfolios, and presented for sale, yet the "advocacy" question is not satisfied simply because photos are displayed. There has to be more context to imply advocacy. This is true of non-commercial uses as well. Non-profit companies often believe they can use photos of people in their materials because they are implicitly "non-commercial." But again, the determining factor is whether the person could be perceived as an advocate or sponsor of the organization. Speaking of supply chain, note that the photographer who shot the photo of Rush Limbaugh didn't need a release to take the picture or to sell the image; he didn't need to know what the buyer was going to use it for, assuming he was even aware that someone was buying it. Similarly, a stock photo agency can display the image online, which is how the book publisher (Thomas Dunn Books) found it. The moral of the story is, take "commercial use" out of your vernacular, and only focus on the "advocacy" question. And while that's the right place to start, such assessments are not always easy; people disagree on specific cases and argue incessantly. A common example is photographer's own self-promotional pieces. Naturally, most believe that these are "commercial use" of images, but again, that's not the sole trigger. Most images used as part of a piece that promotes someone as a photographer is almost universally interpreted by the public as "examples" of the artists' work, not necessarily as advocates for them. Such an assertion would require text, often in the form of a quote praising the photographer's work. That context would require consent from the person depicted. As for being in the business of selling photos, photographers are never responsible for having to know the answer the "advocacy question." Someone else is going to publish their pictures, which means that the buyer bears the risk. Photographers or stock agencies can't be responsible for how other people use the images they acquire, especially because one can't make the advocacy assessment until the photo is ultimately put to use, which is long after the financial transaction took place. Lastly, there are portfolios: Photographers do not need releases for photos for these. First, a portfolio is rarely considered a "promotional" item, unless it's put together very poorly. Professional portfolios consist of a collection of artistic works that demonstrate the skills and talents of the photographer. For any given image to be interpreted as to suggest the subject were an advocate for the photographer, particular text would have to be used, which is not typical for a good portfolio, which means that permission is not required in order to use photos of people. This includes all forms of publication of the portfolio, whether in physical form, or as a website, or other media. The one thing to be aware of, however, is that sometimes photographers take pictures of people in special, "closed sessions," where an agreement was made ahead of time—before the photo was taken. If a subject posed for a photographer with the pre-arranged agreement that the photos would not be used in a portfolio or any other manner, than that agreement takes precedent. (Of course, a new agreement, such as a model release, can supersede it.) Such an agreement would have to be established first--it cannot be retroactively enforced. That said, any good photographer would honor such a request, even if he or she didn't have to. The internet is a virtual echo-chamber of facts and myths of all sorts. When something goes viral, there's no stopping it. Even the most blatant falsehoods can perpetuate for years if they cause no harm in believing them. An example is the myth that the different regions of the tongue tastes different types of things: sweet in the front, sour in the back, etc.. In fact, all taste buds are identical, but the myth started from a single, faulty study in the 1800s that was published in a school text book, and it's been repeated ever since. In the photo business, the greatest myths are those involving model releases. If you have ever considered selling (or licensing) photos on your own, or through a stock agency, you've probably been told that photographers need "model releases" to sell photos of people, and "property releases" to sell photos of buildings and the like. Some stock agencies actually reject images unless these photos have releases. While it's true that model release are necessary for certain situations, the actual laws about these issues are deep and complex. As rumors and hearsay perpetuate on the net, the over-simplification has resulted in virtually all the "advice" and conventional wisdom about model releases to be entirely wrong. And the reason why these myths perpetuate is because they cause no harm. No one ever got sued for having a model release. So, people follow the advice because they (and others) seem to be safe, perpetuating the myths. So, why address the myths about model releases? Because photographers are losing enormous opportunity by not trying to sell the images they don't have releases for, and by going to great lengths to get releases they don't need. Despite the rumors, most publications of photos are not the type that need releases anyway, resulting in an enormous market of buyers. Most photographers could continue to have very successful businesses without ever getting model releases, all while doing exactly what they are doing today. Sure, releases are important for many types of publishers, so if you do get releases for their benefit, you can expand your buyer base by getting them. But it's a proportionally smaller market than people think, and the time, effort and resources necessary to properly obtain, manage and catalog releases is rather substantial. This investment will rarely be offset by the incremental income from sales of images that actually do require releases. This article attempts to help the photographer looking to make money by setting the record straight on the most common myths about model releases. Fact #1: You do not need a model release to take pictures. Nuff said. Don't let anyone tell you otherwise. Everyone in the world has a camera on their phones, and photos are taken constantly. You don't need someone's permission to take their pictures. Now, just because you might eventually intend to sell your photos has nothing to do with the ability to take pictures in the first place. Fact #2 You do not need a model release to sell pictures. And "profit" has no effect on whether a release is required. First, newspapers buy photos, and their use of the photo is unlikely to need a release. So, selling a photo (and making a profit doing so) to a newspaper also does not require a release. And because the law does not require you to have any knowledge of the buyer or their intended use of a photo, you are always allowed to sell photos without a release. Fact #3 You do not need a model release to make photos available for sale, either on your own website, or through a stock agency. If one can sell a photo without a release, one must also be able to "make photos available for sale" without a release. This includes the publication of such photos in a manner that would allow potential buyers to find them. The legal case that established precedent for this was Corbis vs. James Brown, where the judge called the depiction of a photo as being for sale a "vehicle of information". Here, consent from a subject is not required. Therefore, one can make photos available for sale in any manner of publication and media, whether it's traditional print or online formats, including personal web pages, photo-sharing sites, social media sites, stock photo sites, or mostly anywhere. For detailed information, see the article, Model Release Primer. Fact #4: A "property release" is NOT required to sell or buy photos of buildings or people's personal property (like land). The root of this misunderstanding is complicated. The term "property" in an actual "property release" refers to two particular forms of intellectual property: trademarks and copyrights. Examples include logos, designs and other works. Now, just because these are "protected" works, it doesn't mean that one cannot publish photos of them. It only means that the manner in which such works are depicted cannot cause confusion among the general public about who "owns" the properties, or other legally complex factors. It is impossible for a photo of a bottle of coke to cause the general public to suddenly think that the Coca Cola company was now owned by a freelance photographer in Topeka. If the photographer sold the image to a publisher, and the publisher's use of the image would imply that it had a unique and special business relationship with Coke, then that would trigger a trademark infringement claim. But that would be with the publisher, not the photographer, nor the stock agency that sold the image. Furthermore, such an infringement couldn't possibly happen by merely the photo being printed. Text around the photo would have to give this impression. And, since the photographer or anyone selling such a photo cannot know or control how a publisher uses a photo, they could never be held liable for the infringement. Like the myth about the tongue's different taste regions, the history of the "property release" stems from a single misimpression from long ago. Certain physical structures, such as the Golden Gate Bridge and the Transamerica building in San Francisco happen to be registered trademarks. And, they have been infringed upon inappropriately in the past, but these were cases that have nothing whatsoever to do with photography. And at the time, news of these suits briefly caused publishers to shy away from publishing photos of such places unless photographers could provide property releases for them. Those releases were not for the buildings, but for the right to use the trademarks. This was very short-lived, however, because it is impossible for photographers to obtain "true" (and legally valid) property releases for trademarks without paying enormous sums of money. So, even though the publishers stopped asking for those releases, the rumor perpetuated nonetheless: photographers erroneously interpreted these requests as "mandates" that all photos of buildings required "property releases." And they've been behaving that way ever since. To be crystal clear, property releases are not required to sell or resell photos of buildings and other real estate (or physical property of any sort, such as land, pets, livestock, homes, etc). If something happens to be a registered trademark (building or otherwise), then the publisher will already be quite aware that they are the ones that need to obtain permission from the trademark owner (which may not even be the building owner). Any permission obtained by the photographer would be entirely useless to the publisher. In fact, every single property release used by photographers gives no legal right to use a trademark, and since buildings and other items do not require consent for photos of them to be used, these property releases are worthless pieces of paper. But they also cause no harm. For more, see Photographers' issues concerning trademarks and photography. Fact #5 You usually do not need permission to shoot pictures of (or on) private property. While it's true that property owners can restrict photography, that's not saying much. They can also stop you from picking your nose. It's their property, so they can stop anyone from doing anything. You've seen signs that say, "No shoes, no shirt, no service." There's also the sign that reads, "We reserve the right to refuse service to anyone." In short, property owners can apply restrictions indiscriminately and inconsistently and arbitrarily. But, the owner has to proactively take an action to prevent you from doing things. It's not that you're prohibited from actions by default, and they then grant you permission later. So, most of the time, there are rarely (if any) actual restrictions property owners enforce. So, if you're in a bar, or in an amusement park, or touring a winery, you are allowed to take pictures unless you're told not to while you're there. And if you do take pictures, you can sell them to any buyer willing to assume the risk, if any exists. Sometimes, photographers will often seek permission to shoot pictures ahead of time. This is not only unnecessary, but invites someone from stopping them. If you know ahead of time that you will need permission, that's another story. Fact #6: You do not need releases for Art, Books, Exhibitions, Presentations, Fairs, Contests, Postcards, Calendars, Etc. At the risk of over-simplification, the only time a release is needed is if a person can be seen as supporting or advocating an idea, product or service. True, there are often disputes about whether a given publication of a photo of someone could be construed in such a way, but the dispute gets closer into the safety zone when that publication is a form of artistic expression. The First Amendment of the US Constitution protects "artistic exhibitions" (and publications) as a form of free speech, so consent from anyone else—by definition—is never required. Money or profit has nothing to do with whether a work is published or "depicted in an artistic manner." Again, people argue frequently about whether such depictions are, in fact, artistic in nature, which leads to a complex argument: is it art, and if not, is it a promotion, and if so, is it the type of promotion that should have required consent from the person in the photo? While these are all good questions, the reality is that no one has ever successfully won the argument that a model release was necessary for a photo that was used in a book, in an art gallery, or at a fair, or any of the items in the above list. In short, the law is on the side of the First Amendment by default - a claimant bears the burden of proving otherwise, and that's a difficult and very expensive bar to clear. While is indeed a very deep and complex subject, those wishing to seek quick answers can feel relaxed: "don't worry. You're fine." For for more info, I encourage you to read this. Fact #7: Photographers do not need releases for photos in their portfolio. A portfolio is a collection of artistic works that demonstrate the skills and talents of the photographer. Permission is not required in order to use photos of people in a portfolio. This includes all forms of publication of the portfolio, whether in physical form, or as a website, or other media. Fact #8: Posting photos online is just another form of publishing. What determines the need for a release is whether a photo makes someone appear to support, advocate or promote ideas, products or services. The medium itself is irrelevant, whether it's traditional physical media, or online/electronic media. One cannot say whether a release is required for photos "posted on the web" because it depends on the way the photo depicts the person in it. When photographers put images on their professional website, they think that this suggests that the people in those photos could be construed as sponsors or advocates, but that's not complete. Putting photos online to "sell" does not require a release, depictions of "art" do not require a release, and a "portfolio" does not require a release. The only way a photo would require a release is if the photographer created a self-promotional piece (such as an ad) that promoted his or her services, and used a photo of someone that might suggest it is a client. Fact #9 Ownership of physical pictures and ownership of rights are different. The same thing is true of pictures taken on (or of) people's property. They think that because it's their house, or their private event, or their pet, that they have the rights to the photos. They don't. Nor can they stop the photographer from publishing those photos. Non-humans do not have inherent rights, unless protected by trademark or copyright. The reality is that photographers (and stock agencies) don't get sued for the publication of an unreleased image. And given the very high cost of suing someone, litigants are usually told by their lawyers to go after the "publishers" of the images in question, as they are the ones who bear the true legal liability. As an active photographer, understand that most people are entirely uninformed about model releases, and factor this into your business dealings. Publishers, stock agencies and many others may vehemently demand a model (or property) release before buying photos, or for accepting your images into a stock agency. Despite their being wrong, this is the way of the world, and you can only do what they ask, or don't play. But don't underestimate the sales potential of your unreleased images, and the large market of buyers who don't make such demands. For those with interest in reading the details, I have many articles that answer all the technical questions, like this one and this one. I also wrote a book called, Photographer's Guide to Model Releases.